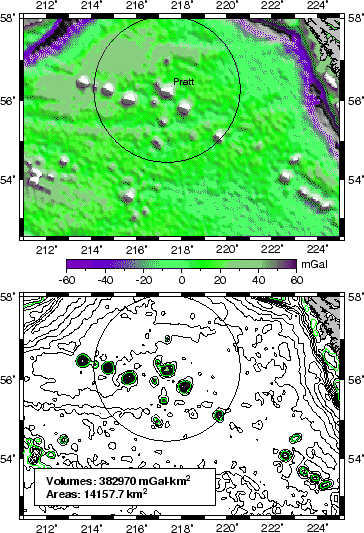 To demonstrate potential usage of the new programs grdvolume and gmtselect we extract a subset of the Sandwell & Smith altimetric gravity field7.3for the northern Pacific and decide to isolate all seamounts that (1) exceed 50 mGal in amplitude and (2) are within 200 km of the Pratt seamount. We do this by dumping the 50 mGal contours to disk, then making a simple $AWK script center.awk that returns the mean location of the points making up each closed polygon, and then pass these locations to gmtselect which retains only the points within 200 km of Pratt. We then mask out all the data outside this radius and use grdvolume to determine the combined area and volumes of the chosen seamounts. # of radius = 200 km centered on Pratt. # the ones within 200 km of Pratt seamount. Our illustration is presented in Figure 7.18. Figure 7.18: Volumes and geo-spatial selections.